Plating Color: 18k Gold / Silver Occasion: Anniversary, Engagement, Gifts, Wedding, Etc. 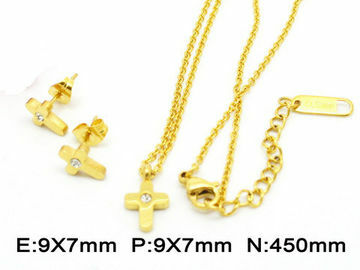 The Pendant shape: cute cross with 8cm extention chain. Stone chape and color: clear white crystal. Post shape: post with stud. Plating:18k golden / silver for choose. Usually we make it with 304 stainless steel, but if you need better quality, you can choose 316 or titanium stainless steel. 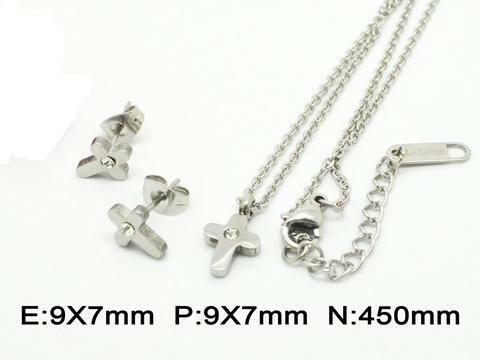 The pendant is with very simple but unique design, it has exquisite craftsmanship in high quality. OEM and ODM are accepted. Hot Tags: Cross Pendant Set, Cute Pendant Sets, Religious Pendants Sets, Stainless Steel Pendants Sets.